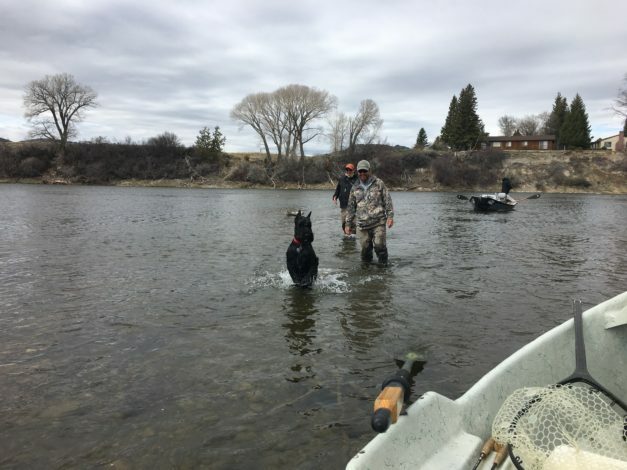 Last year, we fished the Madison River both inside Yellowstone National Park and outside in Montana. The Madison is one of those rivers that always produces fish and sometimes gives you an “epic” day on the water. 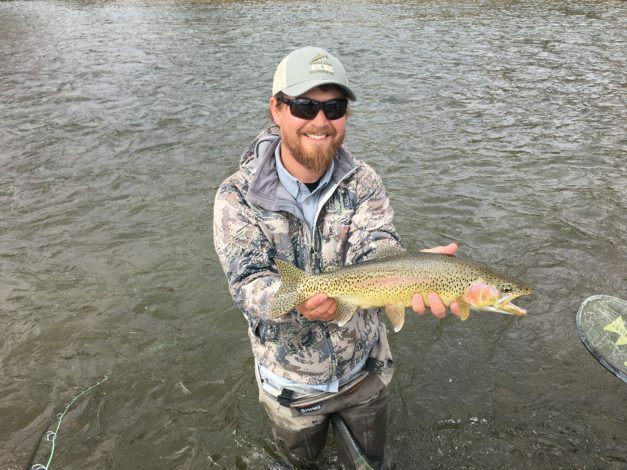 We had that epic day, inside the park, with Patrick Daigle of Blue Ribbon Flies in West Yellowstone, swinging flies in October. 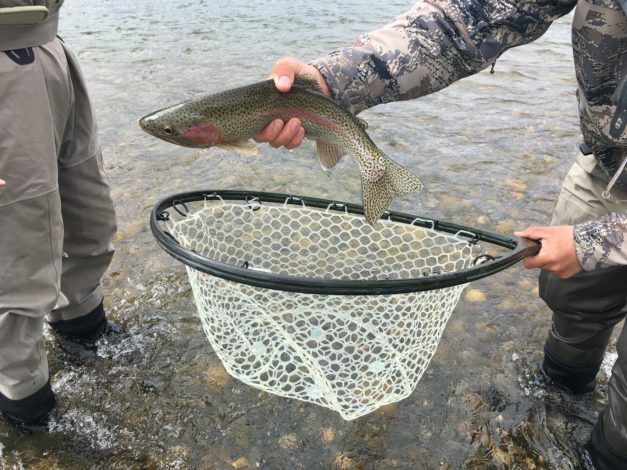 We had another epic day on the wate,r outside the park, this past week with Steve Smith of Rivers Edge Fly Shop in Bozeman. 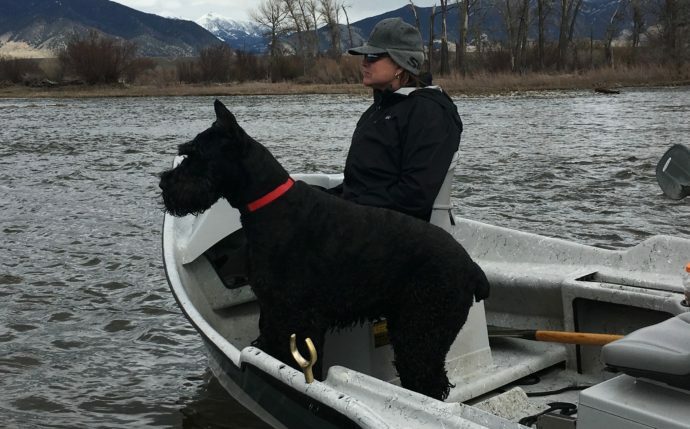 Barb and I were in a boat with Steve and our Bozeman friends, Sue Doss and Dud Lutton along with their dog Solomon, joined us for the trip. We put in at Burnt Tree on a cold, breezy morning and were a bit concerned about even more wind and cold hitting us all day. As it turned out, if it did get colder and windier, we didn’t care because we were ON fish all day. We fished from the boat most of the morning but focused on the deeper buckets as we drifted downriver. 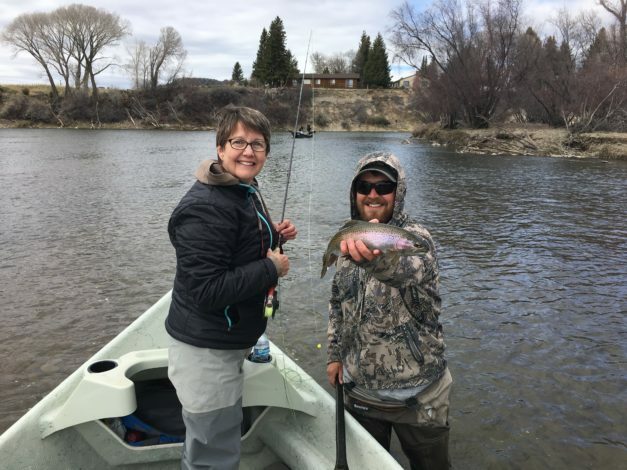 We were hitting fish all morning, both browns and the most beautiful rainbows, all in the 14″-16″ range, with a few 18″-20″ fish as well. When we stopped for lunch with Dud and Sue, we shared stories and what was working. It was all wire worms and small midges doing the trick. Red seemed to be the color of choice for these hungry trout. At lunch, we’d dropped anchor in a “fishy” spot, so after we’d eaten, Barb fished in a one person hole and I took over picture responsibility. Bam! Fish on… and what was so funny, was that about 30 yards downstream, there was Solomon, jumping out of Dud’s boat, and heading upstream to be a part of Barb’s catch. Dud came running upstream to bring Solomon back to his boat, but once back….. BAM! Barb hooked another fish and Solomon was on the move. We did this another 4 or 5 times before pulling up anchor to begin our afternoon of fishing. We’d had an incredible morning and couldn’t imagine the afternoon getting better, but it did. Instead of fishing from the boat, we found spots to get out and wade fish. In each spot, we hooked into fish again and again. Strong, beautiful trout ready to bend our rods and boy did they. We fished about 5 different buckets after lunch and at each location, we caught so many fish. When we left to fish the next spot, we full well knew there were even more fish that could have been hooked in the hole. You never want to use the “E” word but this day was EPIC! At the end of the day, we floated downriver, enjoying the incredible scenery around us, the snow on the mountains and even a moose taking a peek at the drift boat as we slowly passed. We’re still talking about how great the trip was and how Steve was a great guide.